It was indeed the perfect way to start the week for Sonu Sood as early this morning, he got the good news that he has won the Nandi Award for Best Villain for his role in the Telugu blockbuster Arundhati. The Nandi Awards are extremely popular down South and it is no wonder that Sonu is elated at bagging this honour. Speaking to us, Sonu said, "Bagging this award is really a dream come true for me. I have heard a lot of actors from the South dreaming about winning one Nandi award during their entire career; for me to bag this award and that too at an early stage of my career is a very special feeling. I am really excited and my phone hasn't stopped ringing ever since the results were announced this morning. Now, I can't wait to receive the award when the ceremony is held some time in December at Hyderabad." 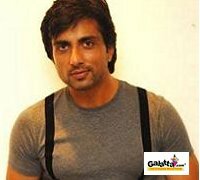 When we asked him a bit about his role in Arundhati, Sonu said, "I play a ghost in the film. It's the character of a guy who is killed and how he returns back to seek revenge. I sport different looks in the film and I had to undergo nearly 6-7 hours of make-up sessions at times to get the right look for the character. But now, after the super success of the film, I feel that it has indeed been worth it." Arundhati, which went on to become a huge hit down South (both commercially and critically), is now being remade in Hindi and yes, Sonu stars in the Hindi version too. "Yes, we are remaking the film in Hindi too. We plan to start shooting some time in January next year as I am currently busy with Arbaaz Khan's first production Dabang," signs off Sonu.